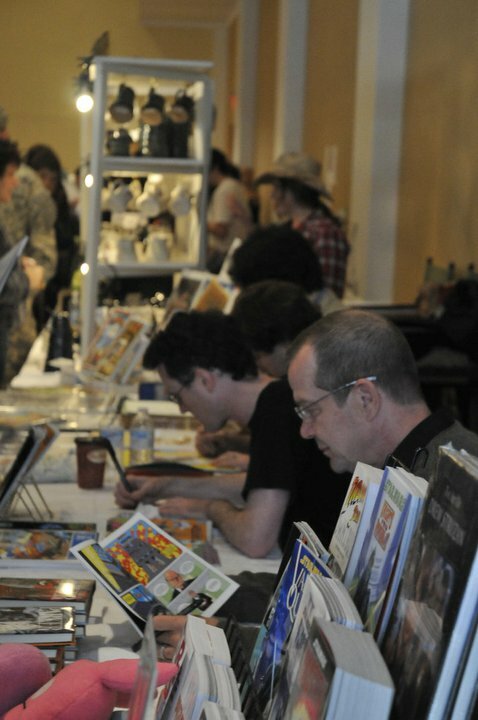 Yep, that's Darwyn Cooke, checking out the first issue of SLAM-A-RAMA at Hal-Con this past weekend. The photo was taken by Calum Johnston, who was kind enough to seat me next to Darwyn on Saturday and Sunday--a pretty high profile seat at any convention. It was a great show, with lots of crazy costumes (man, people sure do love DOCTOR WHO these days! ), and I sold lots of SCENESTER and SLAM-A-RAMA and did lots of drawings for people (mostly kids, which is awesome--I think I drew my first-ever Ghost Rider!). If anything, the experience taught me that I really need to be sketching for at least a few minutes a day, just to stay in the habit. It's been a week since the show, and I still need to get that particular discipline up and running. I'll be off to Montreal for Expozine next weekend, which should be fun. I hope no one's upset that I don't have my stuff translated into French yet.